The Yellow River is the famous river in the plains of China. Predicate as the second longest river in China to make his fame no doubt. Well, one of the attractions that are served by this river is the Hukou Waterfall. Hukou Waterfall is the largest waterfall in the stream of the Yellow River have stunning views. 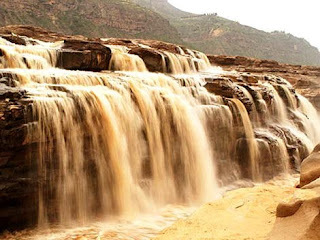 Waterfall is naturally formed when the flow in the middle of the Yellow River flows through a large canyon Jinxia. 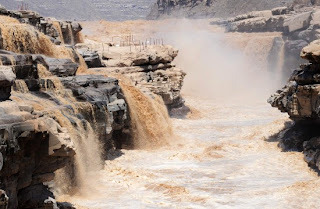 Because of its large size, the width of Hukou Waterfall vary according to season. Typically 30 feet but can increase up to 50 meters during flood season. Regarding height, the flow from the point of falling over 20 meters. Right under the waterfall, you'll find a shiny stone called guishi. Which makes it seem mysterious stone, although the water level rises or falls, and any large volume of water, part of the stone is still visible. Under the waterfall, there are islands Qilangwo bridge connecting the two provinces, namely Shanxi and Shaanxi. In times of clear skies, fog is refracted by the sun's rays forming a rainbow, a bridge is like colorful. Hukou Waterfalls will give a warm welcome to anyone who visited with a thrilling sound, spin waves of gold, beautiful scenery and magnificent power. Because it looks amazing, you can see pictures Hukou Waterfall on the fourth series of renminbi banknotes previous 50. Hukou Waterfalls has for years attracted visitors from around the world. You can have a better understanding of this natural wonder if you come in person.